Here’s a “finished object” in the knitting department. I started it the first weekend of November while at knitting retreat. It’s an adaptation of a pattern called “Bobble Shirt” by Carol Lapin in the first Jamieson’s Shetland Knitting Book (I have added a link because it is still available both new and used). The main yarn was a lovely handpainted Blue Face Leicester DK from Fleece Artist, a dyer in Nova Scotia. 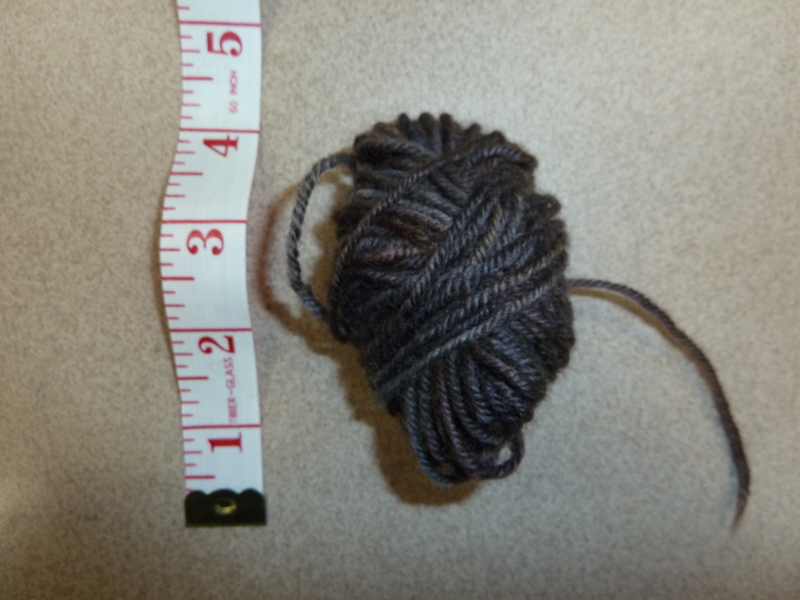 I bought two skeins in the Ebony colorway at Knit Purl in Portland, OR several years ago. It’s time had come! Each skein was 250 gms, 450 meters – so I had about 1000 yds of DK weight, which knits up at 5-1/2 sts per inch on a US 6 (4 mm) needle. For the two bottom tiers or layers, I rummaged through my box of discontinued Rowan Designer DK and found the cocoa brown and dark gray that seemed to work with the handpaint. I needed two 50-gm balls of each of those colors, but only had one of the gray, so I had to substitute something “close but different” to finish the bottom layer – but it is hidden underneath the cocoa layer and you will never see it. So here are the changes I made to the pattern. This is a BIG drop shoulder design so I knit the “smallest” size which was a 45″ circumference. Added “purl darts” (column of purl stitches every 10 stitches) to the two bottom tiers to keep them from curling. The pattern has you knit the bottom tiers in straight stockinette, which you know is going to curl up like a roller blind if you don’t do something to keep it hanging flat! This is the big one – changed it from a drop shoulder to a set-in-sleeve design. I used my method for knitting and attaching the sleeve cap directly into the armhole, then knit the rest of the sleeve in the round to the cuff. So overall, not knit in flat pieces and then sewn together – knit all in one piece with no sewing. 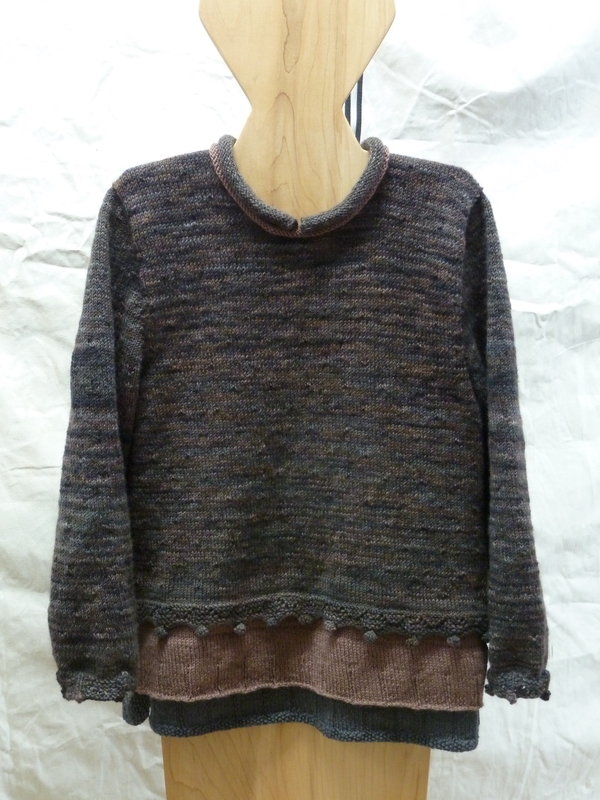 There is some “pooling” of colors in the handpaint at different points throughout the sweater. I struggled with this a bit but decided to just not worry about it in the end. It has to do with the interplay of the width (flat knitting) or circumference (knitting in the round) of the garment at some point, versus the length of the color repeat in the yarn. If I had knit the entire sweater in flat pieces to be sewn together, I am pretty sure I would still have had some color pooling on the sleeves, at least. And possibly also in the yoke, since the width of the body above and below the underarm became different after changing it to a set-in-sleeve design. Also, this being a handpaint, the two skeins were not exactly the same; one was a little more muted in tone for at least part of the skein, so I had to break the yarn and wind off sections and rearrange them to get transitions that were not glaringly obvious. I am really happy with this sweater, it is really comfortable and fits me well. And it is a little different, more whimsical, than what I usually knit for myself. This is how much I had left of the handpaint yarn! It turned out so fun, you should get a lot of good use from it. It’s wonderful! I appreciate the notes and changes to personalize and improve the pattern. Gotta love purl darts and set-in sleeves! Hi Peggy – so nice to hear from you! This was one of the most fun knitting projects I have done for a while – glad you liked it!